A Queen's Award for Enterprise is probably the most prestigious accolade that a UK business can earn and each year we are honoured to be able to host a celebratory dinner for the winners of the International Trade category. The winners are an inspiration to all UK businesses, having demonstrated a substantial and sustained increase in export earningks over three consecutive 12-month periods, to a level which is outstanding for the products and services concerned, and for the size of the organisation. A fantastic opportunity to celebrate your win with your team, the dinner offers a wealth of networking opportunities with thought leaders and businesses involved in international trade. 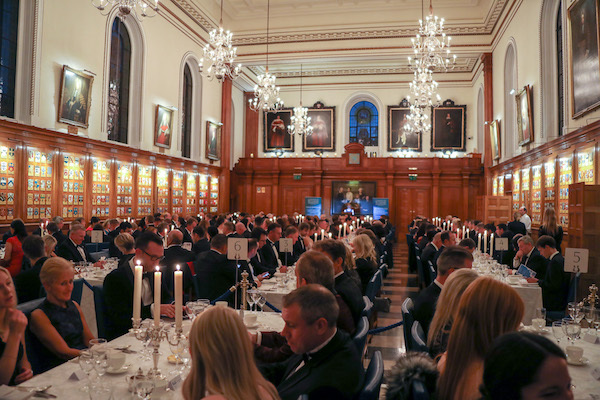 This year's dinner will be held at the Fishmongers' Hall, London EC4R 9EL. One of the Twelve Great Livery Companies of the City of London, and among the most ancient of the City Guilds. With its magnificent riverside position and architecture the Hall provides one of London’s finest settings where decorative splendour is matched by a flair for contemporary cuisine. Tickets are priced at £150+VAT each, or buy a table of 10 for just £1350+VAT. Our Gala Dinner provides a fantastic opportunity for companies to celebrate their award and success with their whole team. It offers a wealth of networking opportunities with successful businesses and thought leaders and any sponsors the exposure to real high-level exporters.